A galloper that took 10 starts to clear maiden grade will shoot for his fourth straight win in Saturday's Listed Christchurch Casino Easter Cup (1600m) at Riccarton. Boots 'N' All has gone from a horse that didn't want to win to becoming one of the South Island's most reliable top-level performers. Riccarton trainer Lance Robinson well remembers Darryl Bradley returning to the birdcage after one of Boots 'N' All's four maiden second placings and saying: "I don't know what you are going to do to get him to win. He just doesn't want to hit the line." Robinson added blinkers to Boots 'N' All's gear and three starts later he produced a maiden win at Timaru and he has gone on to win another seven times in his next 20 starts, including the Listed Timaru Stakes (1600m) in January to begin his current winning sequence. "He just took time for the penny to drop. He had all those seconds as a maiden, but we put the hood on and he hasn't looked back," Robinson said. "If you watched his races early he did a lot wrong. He ran around a bit and didn't know how to find the line. He's just a horse who needed time and he's got better and better." At Timaru, Boots 'N' All defied Son Of Maher to land his first stakes win, turning the tables on the Gr.2 Coupland's Bakeries Mile (1600m) dead-heater that he had finished third behind in the Riccarton feature during November's New Zealand Cup week. But there has been a drawback for Boots 'N' All's rapid rise through the grades and that has come through ratings penalties that sees him carrying 130lbs in the Easter. "He's the worst handicapped horse in New Zealand. He's only won three open races, but he's penalised for being so consistent," Robinson said. "He's on the same rating as Scapolo and he's won $800,000. Our horse has won $160,000. It doesn't seem right. You think we'd still get a couple of kilos off a horse like Scapolo." 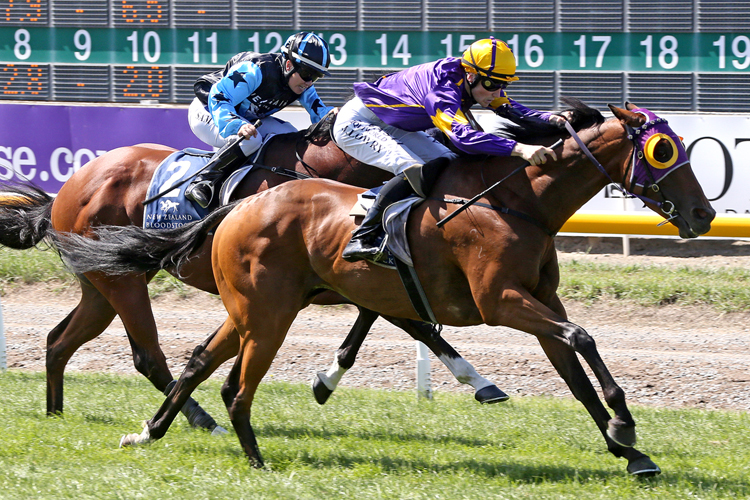 Nonetheless, Robinson goes into the Easter Cup expecting a typically bold race from Boots 'N' All after the Perfectly Ready five-year-old produced a dashing trial win over 5 f at Ashburton last month under stable apprentice Shari Jamie. "It would have been five weeks without a race. There was no suitable race in between and he just went to the trials for a day out," Robinson said. "He was pretty impressive. He had a light weight on his back and wasn't up against a strong lot but he did what we expected. He's come through the trial in tremendous order. We're really happy with him." Robinson has engaged Jason Laking to ride Boots 'N' All with Jacob Lowry committed to Tommy Tucker, reasoning that a heavyweight rider would be carrying less lead. "He's a Group One rider and we just felt it was better him carrying live weight rather than deadweight," Robinson said.